Man Utd was recently hailed as the largest sports club on the planet. For that they can thank their long-serving manager Sir Alex Ferguson. What can we learn from 'the hair dryer'? Manchester United appears in the business section almost as often as the back pages these days, sharing headlines with George Soros, General Motors and the Cayman Islands in the last few months alone. And yesterday's revelation that the club's revenue has fallen by 3% has continued the trend. Yet things are hardly bleak at the club. 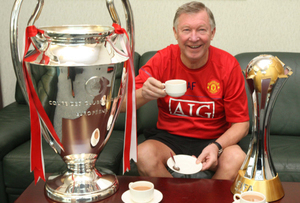 Since narrowly avoiding the sack after a poor season back in 1990, Ferguson has led the club to an astonishing twelve league titles and two Champions Leagues in just over twenty-five years. When players fail to live up to his stringent standards, Fergie is apt to unleash his infamous ‘hairdryer’ upon them. This management method involves screaming in the unfortunate recipient's face from close range with such force that it actually dries their hair (although ironically the spittle expelled during the manoeuvre probably leaves their hair quite damp). While MT (and indeed your HR department) would both eschew such an aggressive management style (employment tribunals aren’t the done thing in football), leaving your employees in no doubt of what's expected of them can be a real productivity booster. But don't be afraid to move on under-performing employees in the end. Blundering goalkeeper Massimo Taibi, signed for £4.5m in 1999, was offloaded after just four appearances following a calamitous 5-0 defeat to Chelsea. It's worth noting that despite being booted/booted out, both Beckham and Taibi still talk of Ferguson with respect, as do most of his ex-players. This becomes useful if they evolve into managers themselves. Which, it turns out, they frequently do. Eleven of Fergie's former charges have managed Premier League teams and while there's short shrift for sentimentality in business or professional sport, it's better to have employees leave you with a debt of gratitude than a yearning for revenge. Consider it like the Mars/Unilever effect. These multi-nationals undertake most of the training for an entire industry. And if your organisation trained half of the people now in charge of your rivals, it definitely gives you an advantage. If employees show the necessary commitment and ability, they should be rewarded with your loyalty. When Roy Keane directed some excessive commitment into Alf-Inge Haaland's knee, or when Eric Cantona scissor-kicked a xenophobic Crystal Palace fan, Ferguson stood by both. He also stood by Rio Ferdinand when the defender was banned for missing a drugs test, and Wayne Rooney when... Well, he's had to stand by Rooney a number of times. When Cantona asked to have his contract terminated after his kung fu exhibition caused a public outcry (and resulted in an eight month ban), Ferguson's support ultimately convinced the enigmatic Frenchman to stay. Cantona duly returned to win two more league titles in the following two seasons, lifting the second as club captain. If your employees are bringing home the bacon and are integral to your team, don't worry about the popular perception of them too much (N.B. this may not apply if they are actually kicking people). To say the Glazer family have proved somewhat controversial custodians of Manchester United is like saying the French have proved somewhat controversial photographers of royalty. A ‘Love United, Hate Glazer’ campaign was launched in 2005 to challenge Malcolm Glazer's ownership of the club and has proved popular, with many fans upset about funds being diverted from the club to service loans used to finance the takeover itself. Last month's part-flotation on the New York Stock Exchange further incurred the wrath of the Supporters Club, who derided the ‘barefaced cheek’ of selling ‘inferior shares which have just 1/10 of the voting rights of the Glazers' shares and no dividends’. Yet Ferguson hasn't a bad word to say about the Glazers, claiming they've ‘been great’ while citing the side's continuing success since the takeover. Rumours he was planning to invest in a counter-takeover by a group of wealthy fans dubbed The Red Knights were swiftly dismissed as ‘absolute rubbish’. Whether Ferguson, a dyed-in-the-wool socialist, actually believes the Glazer's debt-financed strategy is good for the club or not, he knows which side his bread is buttered on. Coming out against the owners, while crowd-pleasing, would probably lose him his job. The lesson is: as long as your board keeps backing you, keep backing them. Though widely respected throughout the game, whenever Sir Alex angrily berates a referee for not adding enough injury time, or tells a reporter to ‘f**k off’, his critics quickly point out that such bullying behaviour hardly befits a knight of the realm. Yet one suspects that, to some extent, each outburst is calculated. Harassment of officials may in fact be designed to encourage more favourable decisions in future, while the ‘mind games’ he indulges in with other managers, usually consisting of well-judged barbs and aspersions, have often proved effective (most potently on Kevin Keegan). His treatment of the media also bears investigation. When the BBC broadcast a documentary that made allegations against his football agent son Jason Ferguson regarding his dealings involving Manchester United, Ferguson Snr. refused to speak to Auntie for seven years (in flagrant disregard of Premier League rules, which require mandatory interviews with rights holders). Several journalists and newspapers have similarly been frozen out over the years. Does this make reporters and editors slightly more likely to spike disparaging articles? Probably. They need him more than he needs them - and as soon as you know who you're indispensable to, you know who you can control.